A U.S. tank follows a YPG terrorist convoy in Syria, Dec. 5, 2017. A recent U.S. intelligence report acknowledges the People's Protection Units' (YPG) link to the PKK terrorist organization, a known fact that has been highlighted by Turkish authorities numerous times before. 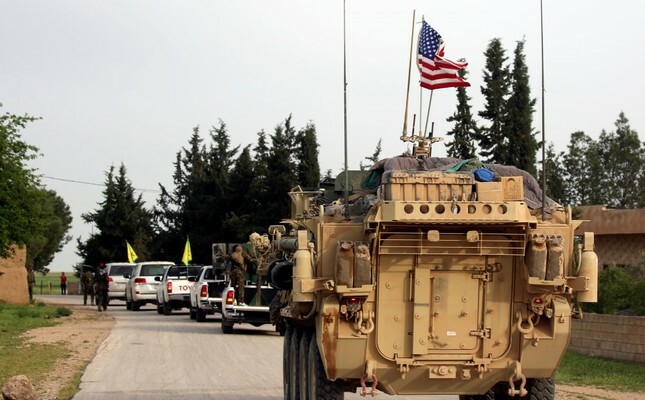 However, despite this report, Washington remains dead set on its contradictory stance as the U.S. government still supports the YPG in its fight against Daesh, yet at the same time recognizes the PKK as a terrorist organization. "Turkey will continue to view, as existential threats, the [PKK], including its People's Protection Units (YPG) militia in Syria," read the U.S. Director of National Intelligence's (DNI) 2019 Worldwide Threat Assessment report, which was published on Tuesday. The 18 U.S. Code § 2339B on supporting designated foreign terrorist organizations clearly states that "whoever knowingly provides material support or resources to a foreign terrorist organization, or attempts or conspires to do so, shall be fined under this title or imprisoned not more than 20 years, or both, and, if the death of any person results, shall be imprisoned for any term of years or for life." The close U.S. partnership with the YPG since President Barack Obama's administration has always been a sticking point in Washington-Ankara relations. Turkey sees the YPG as an extension of the PKK that has claimed the lives of more than 40,000 people in its 30-year terror campaign against Turkey. The U.S., however, while listing the PKK as a terrorist group, has opted to continue steadfast militarily support for the terrorist organization under the pretext of fighting Daesh despite warnings that the YPG does not represent Syrian Kurds. This is the second time DNI described the YPG as the PKK's Syrian militia. "The Kurdish People's Protection Units – the Syrian militia of the [PKK] – probably will seek some form of autonomy but will face resistance from Russia, Iran and Turkey," read the 2018 assessment report of DNI. The power vacuum sparked by the Syrian civil war gave the YPG an opportunity to practically apply its form of governance and form communes as dictated by its ideology. On July 19, 2012, the group began their efforts to gain autonomy by establishing a de facto autonomous region in Syria by connecting the northwestern Afrin canton to the Kobani and Jazeera cantons in the northeast, which, Ankara describes as a grave threat to its national security. DNI is not the only report to acknowledge the link between the terrorist organizations as several U.S. reports previously referred to the YPG's links with the PKK. A Tactical Action Report (TAR) prepared by the U.S. Army Training and Doctrine Command, had recognized the affiliation between the PKK and the YPG terror groups. Also, in January 2018, the CIA had officially confirmed that it sees the YPG, as the Syrian wing of the internationally-recognized terror group, PKK. Under its "The World Factbook" section and Syria subcategory, the agency listed the Syrian-based YPG as a PKK branch under foreign-based terrorist groups. However, the agency later changed the expression on the PYD in the web section. The YPG's organizational links with the PKK also came to the agenda in NATO meetings. In May 2018, the YPG was defined as an offshoot of the PKK in a draft report of the NATO parliamentary assembly for the first time following Turkey's efforts. The Turkish delegation in a meeting suggested to Julio Miranda Calha, the rapporteur of the "Instability in the South" report, to include the YPG as a branch of the PKK in the report. Even though there was some resistance, the links between the YPG and the PKK were emphasized in the report. Apart from reports, many U.S. officials also indicated the YPG is a PKK extension despite Washington's steadfast weapons delivery to the group. U.S. Special Representative for Syria James Jeffrey said in November 2018 that the YPG is the Syrian wing of the PKK but the U.S. does not recognize it as such. The former U.S. Secretary of Defense Ashton Carter also had recognized the link between the YPG and the PKK while testifying before a Senate panel at the U.S. Congress in April 2016. After admitting the link between the PKK and YPG, Carter acknowledged that the PKK is a designated terror group by the U.S., Turkey and the EU. Previously, Turkey targeted the YPG in two cross-border operations – Operation Euphrates Shield launched in August 2016 and Operation Olive Branch in January 2018 – as well with air and artillery strikes.